Japanese streetwear giant BAPE has had some pretty iconic designs over the years, but perhaps their most popular offering comes in the form of a low top shoe. 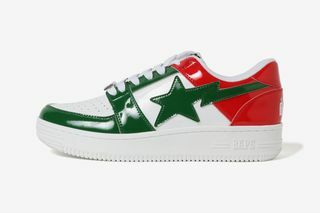 This, of course, is the BAPE Bapesta which looks as though it is heavily inspired by the Nike Air Force 1. The shoe has some in some pretty colorful models over the years and this weekend, the brand is gearing up to release three more colorways that will surely add a pop of color to your feet just in time for the Summer. These colorways include range and dark blue; green and red; and gray, icy blue, and brown. 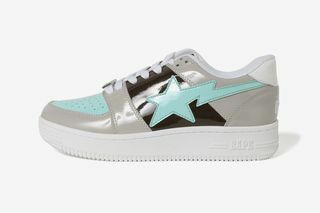 Each one comes in patent leather and features the iconic lightning bolt star logo on the side. These colorways are perfect for the Spring and Summer and will certainly be a must cop for all the BAPE fans out there who haven't picked up a Bapesta in a while. BAPE fans who are looking to cop any of the latest colorways of the popular shoe can do so online on Saturday, April 6th for $265 USD, according to Highsnobiety.